AS someone with a less-than-proud history of serving as a human buffet for hungry mosquitoes, I was more than happy to test out the Zap-It! bite relief device, writes John Doyle. The pocket-sized device promises to take the itch out of mozzie bites, soothe inflammation and reduce swelling by delivering mild “zaps”, or low electrical impulses, directly to the affected area. And what better way for me to test the claim than to pack the zapper into my suitcase and take it with me on a recent holiday to Sri Lanka? Happily for this review (although not so great for me), it took less than one day after my arrival in the town of Galle for the first tell-tale itch to inform me that a pesky blood-sucker had decided to dine out on this pasty Englishman. Resisting the urge to scratch, I immediately reached for my Zap-It! and placed the flat end against the bite site before pressing the clicker the recommended five times. The sensation of the electrical impulse against the skin is not painful, but it does feel like someone is giving you a bit of a pinch. I waited for a few moments and can honestly say that the expected worsening of the itch never materialised. Likewise, the angry red lump that usually accompanies a mozzie bite never made an appearance. So far so good, but over the course of my time in Sri Lanka I came to realise that in order for Zap It! to be effective, it has to be used in fairly short order after the bite happens. For someone as apparently attractive to mosquitoes as me, it was difficult to notice each bite as it happened and the effect of the device was far less noticeable when used on an area bitten hours beforehand. Zap It! is really easy to use, perfectly sized for travel and undoubtedly effective if you’re vigilant enough to notice bites as they happen. The product’s only apparent limitation is in not easing the symptoms of bites that go unnoticed at the time. 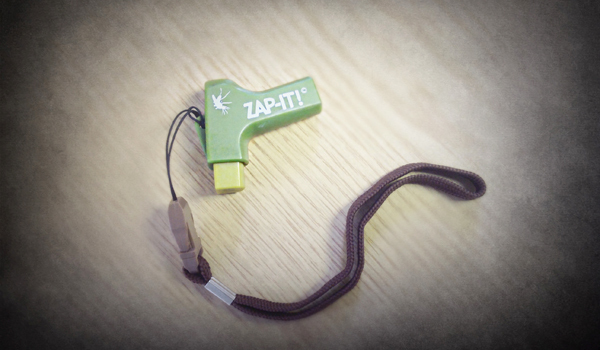 At £5.95, the zappers are well priced and are expected to last for up to 1,000 bites, meaning all but the most unlucky of travellers should be covered for years to come. Zap-It! can be used by everyone as and when required, except epileptics, those fitted with a pacemaker and children under four. Do not use directly after applying repellent.